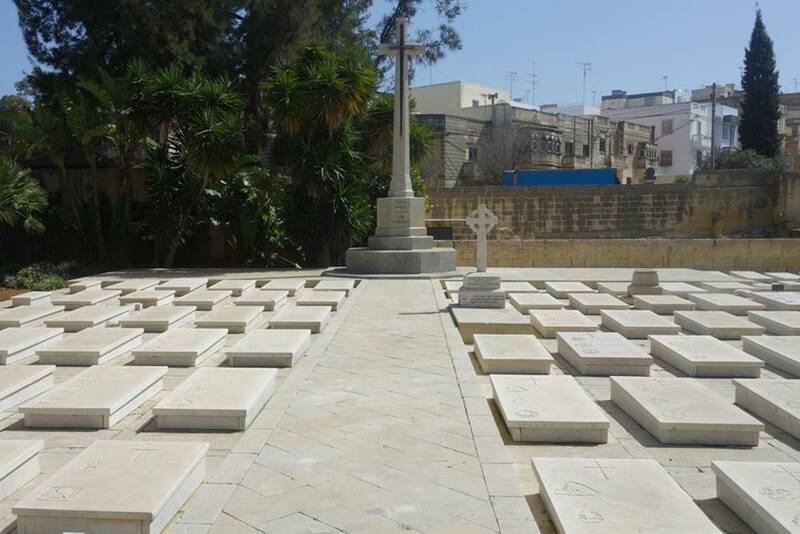 Pieta Military Cemetery contains the graves of over 1,400 Commonwealth service personnel who died on Malta. Over 1,300 burials date from the First World War with the Commonwealth War Graves Commission (CWGC) also caring for over 700 graves which date from before and after the two world wars. The cemetery is located a short walk from Valetta, just past the Ta-Braxia Cemetery as you walk downhill from the city. The interior is beautifully kept, and presents from the entrance, with its lines of weeping willows, an imposing and impressive appearance, embellished by sculpture, in stones, crosses and other memorial tributes. Recent interments are marked by heaps of flowers, constantly renewed by visitors, whose kindly thought for the lonely occupants touchingly signifies sympathy and affection for somebody’s dear one, and for those afar who mourn their loved and lost at rest in Malta’s bosom. The cemetery’s cross of sacrifice is shown below and you can see a couple of private memorials, including one to Second Lieutenant Herbert Churchill Royal Engineers. 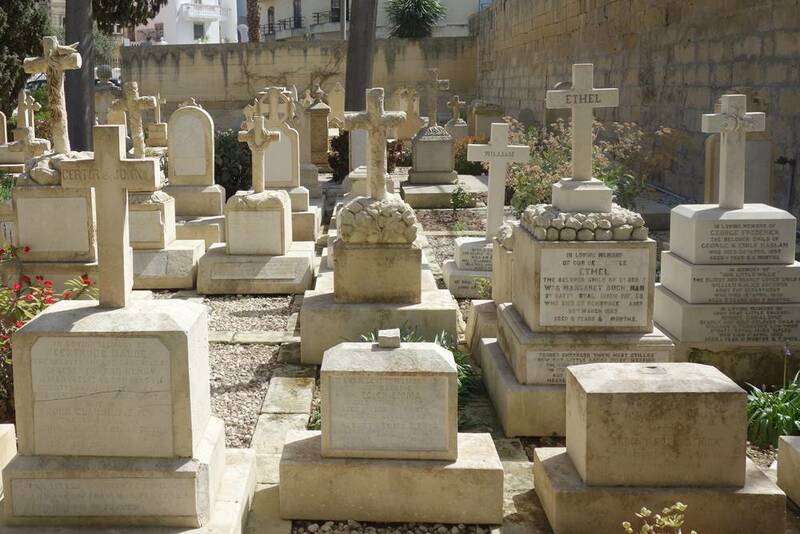 The vast majority of Commonwealth graves in Malta are in collective burials, typically of three to four individuals. This is due to the shallow earth found on Malta and the need to cut graves into the hard rock below. 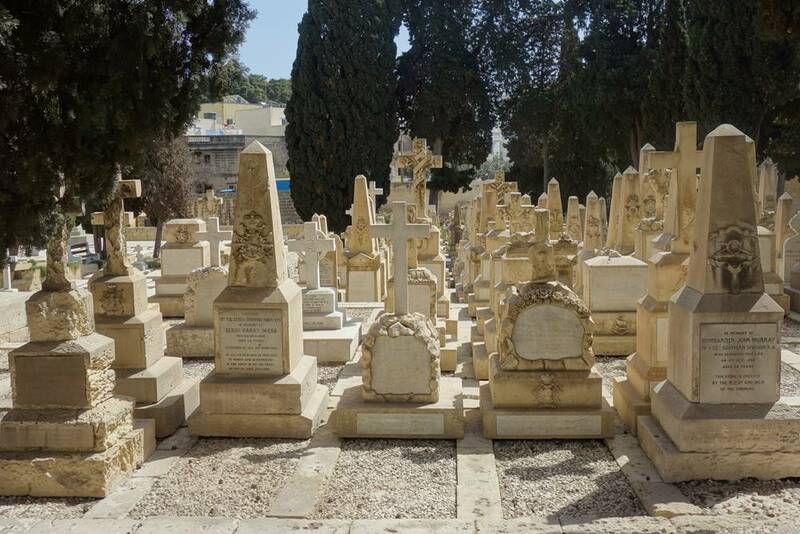 You will see private headstones in Malta’s cemeteries for First World War burials rather than the standard CWGC one you’ll see in cemeteries on the Western Front. As Malta was away from the frontline it was possible for families to have headstones erected after the burial. It wasn’t until after the war that the CWGC placed the flat stone headstones which are associated with burials on Malta. 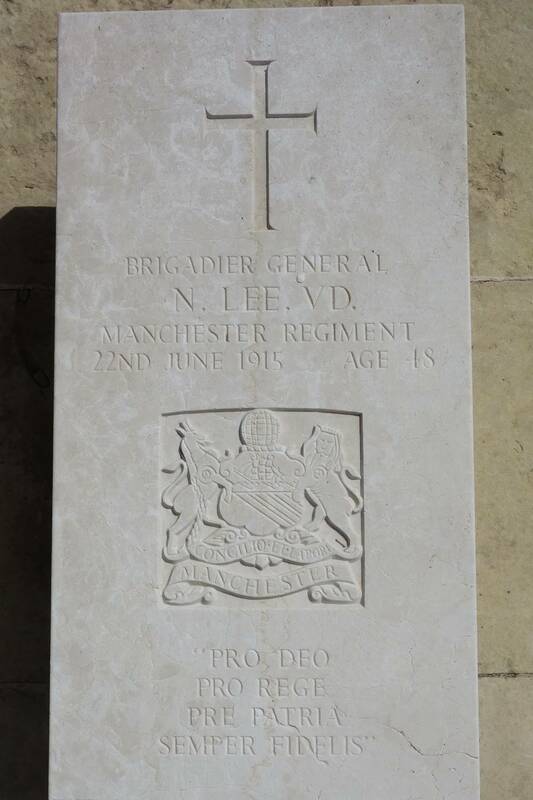 Below is the grave of Brigadier-General Noel Lee, one of two Brigadier Generals who died of wounds received at Gallipoli and are buried in Pieta Cemetery. 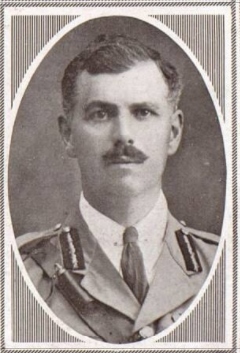 Brigadier General Lee was commanding the 127th (Manchester) Brigade when he was wounded in the throat by shrapnel on the 4 June 1915 at Krithia Nullah and died from a haemorrhage when the wound reopened on Malta. The 127th Brigade consisted of Territorial Force (the forerunner of the Territorial Army) battalions of the Manchester Regiment, recruited from the city and the surrounding area. The Brigade suffered terrible casualties at Gallipoli. The other Brigadier-General is George Benjamin Hodson, who was mortally wounded while commanding the 33rd Infantry Brigade at Gallipoli. If you’re searching for a casualty, especially an officer, it’s always worthwhile searching the British Library’s newspaper archives. I have written an article about searching newspapers and I found the portrait of Brigadier-General Lee below searching the archive. Another soldier who is buried in the cemetery is Trooper Charles Setoun Harvey, who served with the Lothians and Border Horse in France and Salonika. 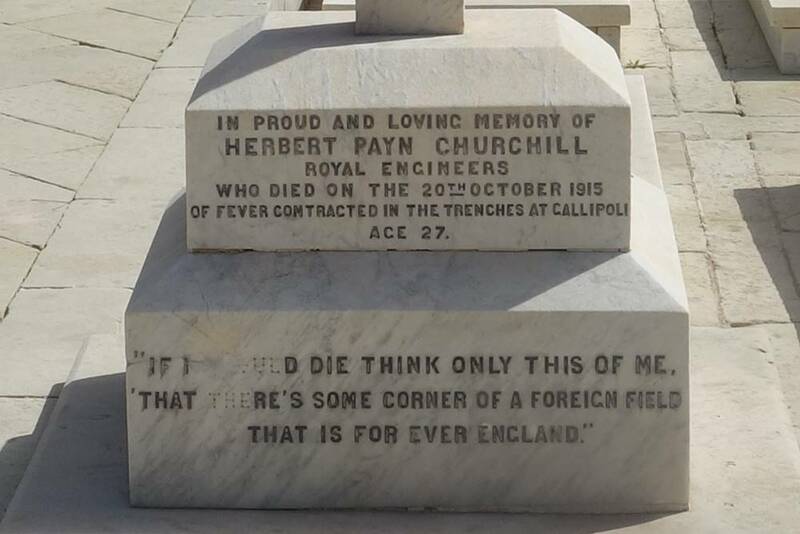 Charles died of malaria and dysentery in hospital at Malta on 19 October 1916 and was buried the next day. 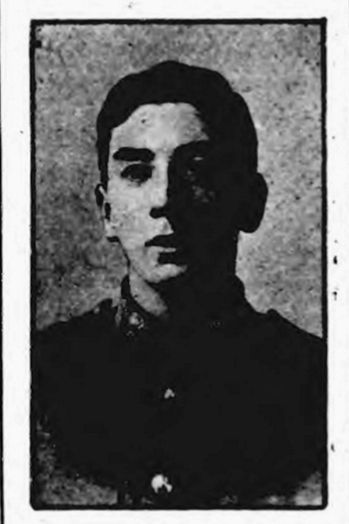 He was a warehouseman in Harwick before the war, and the only son of Mr and Mrs Harvey of Minto, Harwick. The Salonika Campaign was one of the forgotten fronts of the war as Allied forces fought against Bulgarians in the Balkans. The main British effort was along the present-day Greek-Bulgarian and Greek Macedonian border. Disease decimated the Allied forces involved, especially malaria. The strain of malaria in Salonika wasn’t as deadly as that found elsewhere and it was probably the combination of dysentery and malaria which caused Charles death. 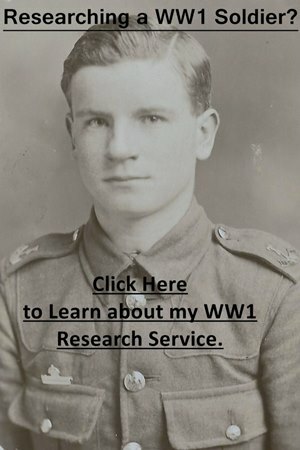 If you are researching a soldier who served in the First World War, click on the photograph below to learn more about my First World War research service.